MAXIMIZE COMFORT AND CONVENIENCE: Padded shoulder straps and cooling back pads to keep your back safe and cool all the way to the blind. 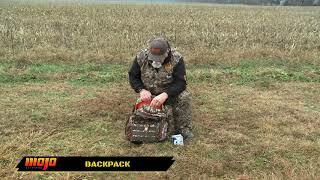 The MOJO® Elite Series™ Backpack was crafted with a durable water resistant material in the Mossy Oak® BLADES camo (orange interior), maximizing comfort and convenience. Holds at least 1 full size Elite Series™ King Mallard™ spinning wing duck decoys + pole, extra 6V rechargeable batteries, detachable lanyards on the shoulder straps and a padded sunglasses case.